India celebrates many festivals through the year owing to its various regional traditions. Many of the festivities are related to the harvest season as thanksgiving prayers and celebrations. One such festival is the new year which though different for each community has almost a common concept of spring season and new crop. Maharashtrians celebrate the first day of Chaitra Shukl Pratipada(March April) as Gudi Padwa and the same day is celebrated by people of Andhra Pradesh and Karnataka as Ugadi. Though the Sindhi community also celebrates their new year ‘Cheti-Chand’ on the same day but it commemorates the birth of their saint Lord Jhulelal. The Kashmiri hindus celebrate ‘Navreh’ around same time. All these celebrations are according to the lunar calendar followed by Hindus. However there are slight variations in each region. So the ‘Baisakhi’ celebrated by Punjabi community and the new year of Bengali people the ‘Poila Baishak’ is around the same time (mid April) but not on the first day of chaitra as Maharashtrians or Andhraites. The ‘Vishu’ of Kerala and ‘Varsh Pirappu’ of Tamilnadu is also celebrated around mid April. We celebrate ‘GUDI PADWA’ being maharashtrians. As kids the only excitement of this day was the food and the sweets and the fact that my birthday according to the lunar calendar of Hindus fell on the eighth day (Ashtami) of this month. Being wished ‘happy birthday’ – once as per hindu calendar and again after few days in April as per the regular calendar was most exciting. Almost all Hindus adorn their doors with the mango leaves-“Toran” and elaborate floor designs “Rangoli” during these auspicious occasions. Sweets and new clothes has always been the simplest form of indulgence at such times. 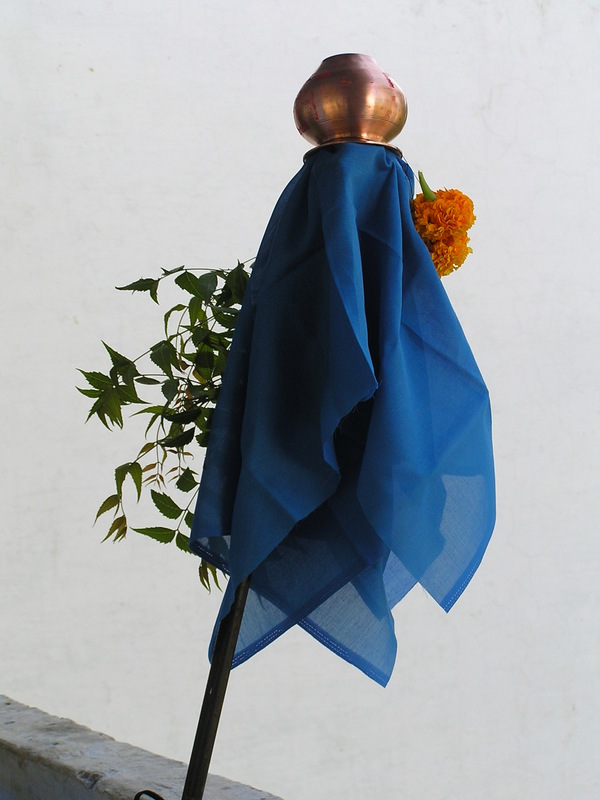 Celebrations of “Gudi Padwa” involve first and foremost hoisting a “Gudi” that is a pole with a cloth and an inverted brass or silver pot adorned with garland, Neem leaves and garland of sugar crystals atop homes or shops. “Shrikhand” is the sweet of the day which is made by hanging curd to filter out all the whey and then added with sugar and saffron to produce the creamier sweets . It is customary to eat the new sprigs of Neem this day as it purifies blood due to its medicinal properties. Gudi according to some beliefs symbolises the “Brahmadhwaj” i.e the flag of Lord Brahma who created the universe. It also is believed to be a lucky charm as it wards of any evil. Some believe it to be the victory flag of Lord Ram who vanquished and slayed demon king Ravan and returned to Ayodhya on this day.